The least good food truck food I've had since the trucks have been coming to L'Enfant Plaza. I asked for no onions, there were onions. There was no feta despite the sign saying that it comes with everything. The lettuce inside was a little "worn". But the worst part was the bread was somehow just wrong-- either stale, or the wrong variety, or under baked or something. The whole sandwich fell apart before I could get it out of the box. Full disclosure: I don't what a doner is. This seemed similar to the other kabob trucks (Tasty and Zesty are the two best).The gyro was pretty good. Full disclosure: I don't what a doner is. This seemed similar to the other kabob trucks (Tasty and Zesty are the two best). The gyro was pretty good. Not as flavorful as some of the other trucks. Wish there has been more food for $8 too. Went to truck by smithsonian. Plenty of choices of trucks but wanted to try this one. Meat was cooked well and lettuce, cukes and sauce were excellent. Would go again. Chicken had very little flavor and was served raw. Didn't realize it until perhaps my thrid piece of chicken. Will never go back. Good value for the price. 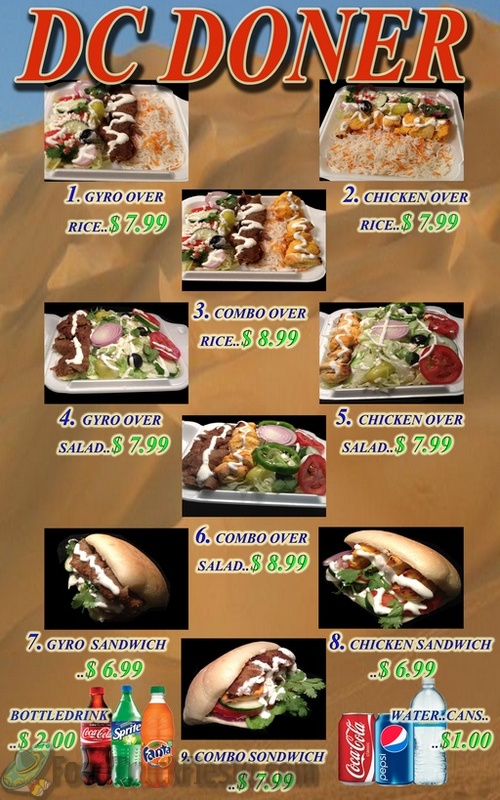 There is a lot of potential in bringing doners to DC with all of the people who have lived/served overseas. This is not, however, a German/Turkish style doner kebap, it's just a Greek gyro in a pita. If they upgrade to thin sliced rotisserie doner meat like the Doner Bistro has, I will gladly come back. The best food I have had from any truck! Food was fresh, tasty, clean, and plentiful for the money. I look for this truck at least twice a week. My favorite truck of them all and the staff is very courtsey and friendly. Pros: Fantastic service. The chicken and sauce were tasty, and the trimmings were fresh and crisp. The gyro meat was uninteresting but still better than the bread. The bread was an anchor dragging this sandwich into nondescript depths. I think the bread came straight out of a flatbread/naan package. It had not been warmed up. It tasted par-baked, chalky, a consistency and texture that indicates the bread needs light toasting or to be finished with a griddle/grill/oven. Finally the bread was definitely not Turkish doner-style sandwich bread. I appreciate that the sandwich was called a gyro, not doner, but the truck still has that name and the pics are still of doner-style bread. So when I want doner, I won't be eating here. Salad (whether w/ rice or on its own) is just iceburg lettuce w/ some stuff on it. Listing on truck doesn't mention auto-application of cilantro (which is yummy or not per person). Won't be eating from here again. 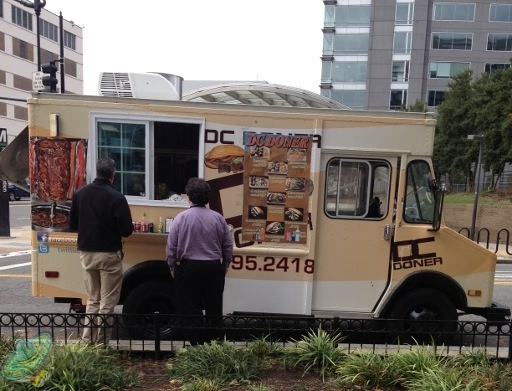 This food truck serves doners, but doesn’t announce locations via Twitter. Here is the menu!